2016 was a huge year for the Rolex Daytona with the introduction of the new steel and ceramic Daytona ref. 116500LN. However, along with this widely reported novelty, Rolex also quietly released other Daytona models at that same Baselworld event, including the two-tone Daytona ref. 116503. The Rolex Daytona ref. 116503 effectively replaced its predecessor, the Daytona ref. 116523. 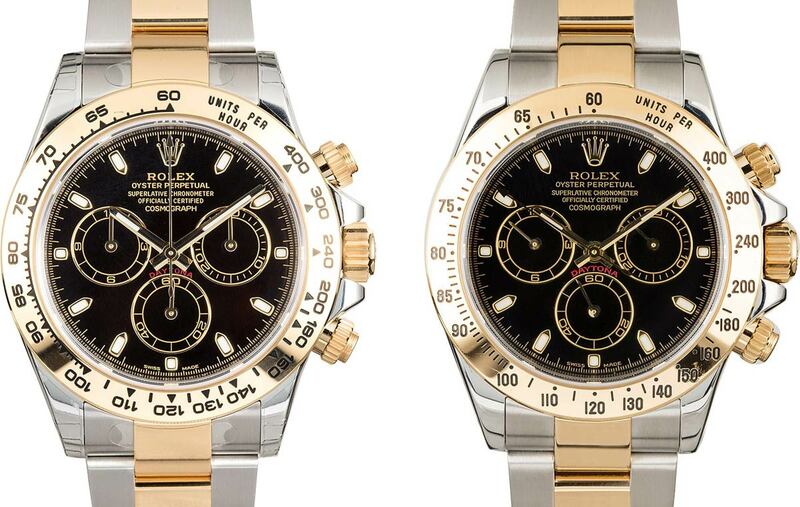 Let’s compare the Daytona 116503 and the Daytona 116523 to highlight the similarities and differences between these two two-tone Rolex chronographs. On the left is the Daytona 116503 and on the right is the Daytona 116523. Rolex released the Daytona ref. 116523 in 2000 as part of the new-generation Daytona collection equipped with the new in-house Caliber 4130 automatic movement. Remember, prior to that year, Daytona watches ran on caliber 4030, which was a modified Zenith El Primero automatic movement. Like all modern Daytona watches, the Daytona ref. 116523 sports a 40mm Oyster case, screw down chronograph pushers, and a screw-down winding crown. As a Rolesor model (Rolex’s term for two-tone watches), it features an appealing mix of stainless steel and 18k yellow gold throughout the watch. For instance, there’s the yellow gold engraved tachymeter bezel on the stainless steel case and the yellow gold center links framed by steel links on the Oyster bracelet. The Daytona ref. 116523 comes with many dial color and hour marker options, however, they all include the trio of registers at 3, 6, and 9 o’clock. 16 years after the debut of the Daytona ref. 116523, Rolex replaced it with the new Daytona ref. 116503. The new two-tone Daytona is almost identical in looks to the previous one except for a redesigned bezel. The bezel now includes fatter fonts and triangular markings instead of circular ones. In fact, alongside the new 2016 two-tone Daytona, Rolex announced new versions of the yellow gold Daytona and the white gold Daytona with the references 116508 and 116509, respectively. This was done to echo the bezel design of the newer Daytona models in the collection including the Everose Daytona ref. 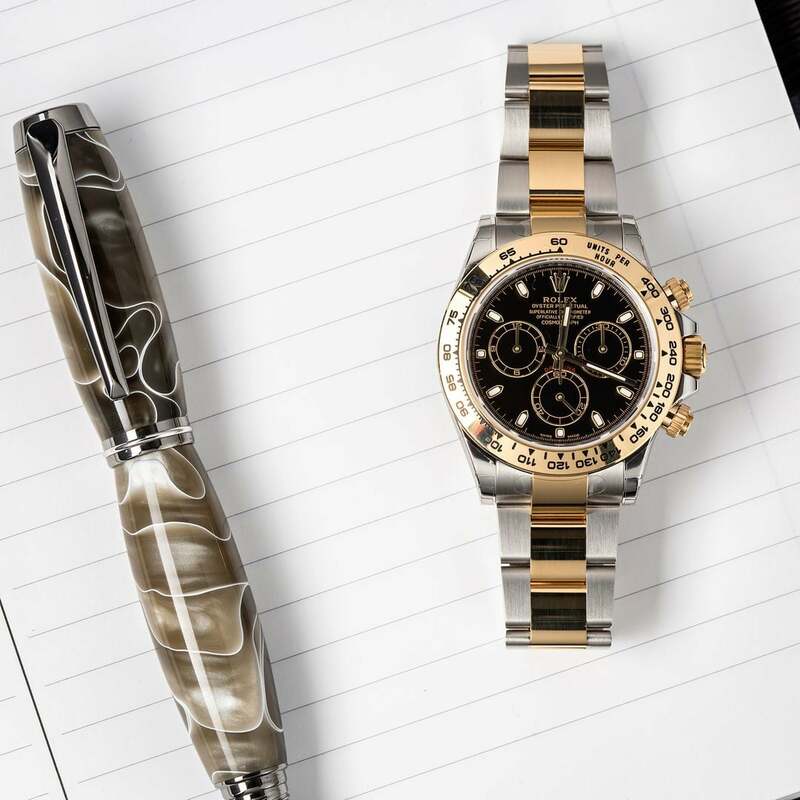 116505, the platinum Daytona ref. 116506, and of course, the steel Daytona ref. 116500. Another detail to highlight is the rehaut engraved with ROLEX ROLEX ROLEX, which was introduced in the mid-2000s. So depending on the specific year of the Daytona ref. 116523, it can come with either a smooth or engraved rehaut. On the other hand, all Daytona ref. 116503 watches come with the engraved rehaut. Which watch do you prefer? The newer Daytona ref. 116503 includes the same in-house Caliber 4130 self-winding movement with 72 hours of power reserve as the preceding Daytona ref. 116523. However, there are a few points of discussion. Rolex enhanced the Caliber 4130 throughout the years to optimize performance. For instance, Rolex launched the in-house made Parachrom hairspring (with benefits such as improved resistance to magnetic fields and shocks) in 2000 in the Caliber 4130 but replaced it with the blue Parachrom hairspring (with improved long-term stability) from 2005 onwards. So again, depending on the specific production year of the Daytona ref. 116523, it can either include an uncolored Parachrom hairspring or a blue Parachrom hairspring in the movement. Conversely, all Rolex Daytona ref. 116503 come with the now standard blue Parachrom hairspring. Another big change to all Rolex movements was in 2015, when the brand adjusted their precision rating to 2/+2 seconds per day. Plus, Rolex also boosted their guarantee to five years from two years. Therefore, the improved accuracy rating and longer warranty only covers those Daytona ref. 116523 watches that were made from 2015 onwards. but is of course, included in all Daytona ref. 116503 watches. At first glance, there isn’t much difference between the classic two-tone Daytona 116523 and the new two-tone Daytona 116503. Yet, as with all things Rolex, it’s all about the small details. With a fresh facelift and an improved accuracy rating, the Daytona ref. 116503 is a worth successor to the Daytona 116523.